Members of the far-right groups Proud Boys and Patriot Prayer march after a rally in Portland earlier this month. Skirmishes broke out with counterprotesters during the day. Left-wing counterprotest groups, including Organized Workers for Labor Solidarity, Radical Women and the Freedom Socialist Party, are planning to stage an afternoon rally to "unite against fascism." Two right-wing groups, Washington 3 Percenters and Patriot Prayer, are planning a “Liberty or Death” rally Saturday by Seattle City Hall that also is expected to draw counterprotesters from the left. The right-wing rally is intended, in part, to oppose Washington gun-control Initiative 1639. The initiative, if passed, would increase the age requirement for purchasing semi-automatic weapons to 21, establish enhanced background checks for these weapons and secure gun-storage requirements for firearms. However, a judge on Friday dealt a major blow to the proposed firearms-regulation measure, raising questions about if it will appear on the fall ballot. Seattle police wrote in a tweet Friday that officers will be directing traffic during the rallies. The Seattle Police Department will be providing public safety and traffic management services to scheduled demonstrations near City Hall Park tomorrow. Planning to be in the area? Please allow extra travel time as there may be delays. In the past, Patriot Prayer rallies have drawn people linked to white-supremacy groups. Marshall, in his Facebook posting, said that he does not want any white supremacists at the Saturday rally, and that he does not want violence or a clash with left-wing protesters. Marshall’s chapter is part of a national network of 3 Percenters, which is heavily focused on the right to bear arms, and reining in what its website calls an “overreaching government.” The group gets its name from their members’ contention that only 3 percent of American colonists were actively fighting against the British during the Revolutionary War. 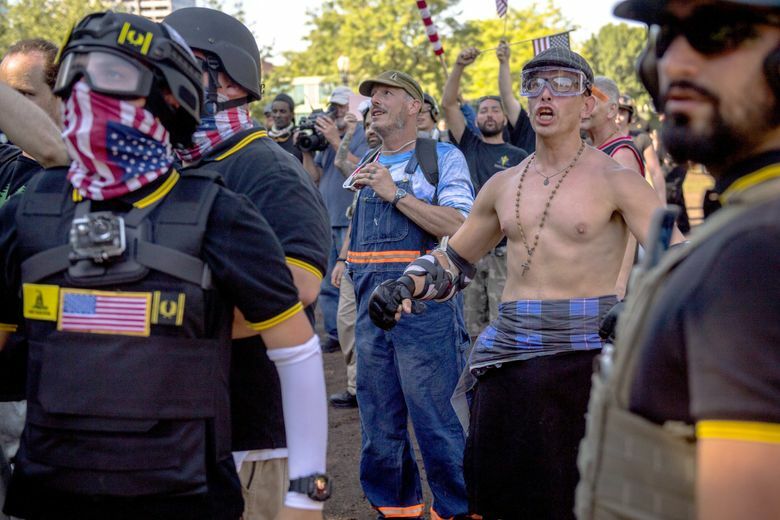 The Seattle rally comes two weeks after Patriot Prayer held a tense rally in Portland on Aug. 5, where police actions involving flash bangs and other crowd-control measures against counterprotesters resulted in some injuries, and sparked an independent review of the tactics used that day.